Women who get pregnant while using birth control may have a genetic variant that breaks down the hormones that are meant to prevent conception, an unprecedented study finds. The paper is the first to discover a gene that may interfere with contraception, possibly offering an answer to the mystery as to why a handful of women every year slip through the contraceptive net. The gene (CYP3A7*1C), though active in all fetuses, is turned off in most adults, but in a minority, it stays switched on. According to a new paper, published today, that gene may filter down the hormones emitted by birth control. What’s more, it can be screened for in genetic testing. Lead author Dr Aaron Lazorwitz warns women not to rush to get genetic screening for the gene, insisting more research is needed to corroborate his finding. But he says it is a milestone for women’s health, which is littered with mysteries. 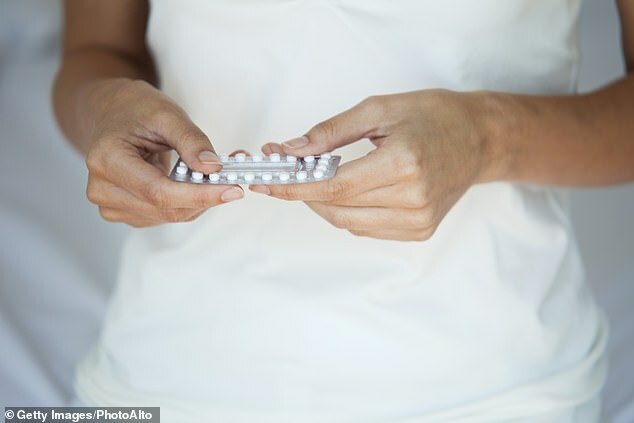 ‘We have been using these hormones for decades now, but we need to start looking at: how do these work for the women we’re giving them to?’ Dr Lazorwitz, MD, assistant professor of obstetrics and gynecology at University of Colorado Anschutz Medical, told DailyMail.com. Each year, up to 8 percent of contraceptive pill users in the US get pregnant while using it. The rate is lower for long-lasting methods like the IUD – around 0.08 percent of users conceive over a five-year period – and the implant – which has a less than 1 percent risk of pregnancy. In almost every case, it’s chalked up to bad luck, Dr Lazorwitz says. ‘As clinicians we have all seen women who come in and say, “I was on the pill, I took it every day,” or, “I was using an IUD,” and yet they are pregnant,’ he said. ‘We’re quick to assume “oh, she must have done something wrong or it was a fluke”. Since the human genome was fully mapped in 2003, researchers in all fields have been able to analyze how genetics influence everything – from cancer to statins. But as far as Dr Lazorwitz knows, contraception remained untouched. ‘This is a new field,’ he said. ‘I think it’s picked up interest in other areas of medicine in the last 20 years but we are a little bit behind in women’s health. His team looked at 100 different genetic variants and picked genes that interacted with hormones and affected how they are broken down in the body. Studying 350 women, they found those who had the defectively expressed CYP3A7*1C had issues metabolizing hormones. The next step will be to look at how this gene interacts with specific birth control methods, particularly the birth control pill which is one of the most widely used methods. Dr Lazorwitz said: ‘I think it’s a good starting point. It’s not the be-all and end-all. We don’t want to make mistakes and we don’t want to scare people. ‘The implant and IUD still are extremely effective. We are more concerned that [this genetic defect] will have an effect with the lower dose methods like the pill. ‘This is one study where we found this variant had an effect that makes physiological sense with what this gene does.